Home / STORE / Nisse / Colourful Nisse Green. 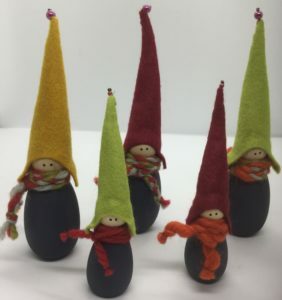 The larger green colourful Nisse has a Dark Grey wood body wearing a woolen scarf with a twist of grey, gold and orange. 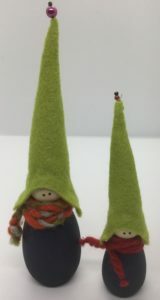 The medium Nisse also has a Dark Grey body and a green winter hat although his scarf is a warm winter red. He stands approximately 12 cm high.